What I mean by that is how you feel about a big decision you need to make, not what you think about it. 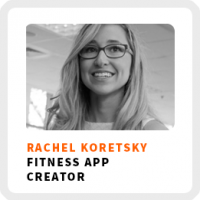 Rachel Koretsky will illustrate what happened to the development of her business when she listened to her gut and when she didn’t. She’s the founder of upace, an app to help increase engagement and retention for at recreation centers like university gyms and the YMCA. The value of targeting niche opportunities. How she’s monetizing her app by offering it for free to consumers without selling advertising. How mentors and listening to her gut helped her develop her app. How she landed her first client from an information interview. Understand your tolerance for risk. Wake up time: Around 8:00am. Core work activities + habits: 1) Follow up with any sales leads. 2) Keep track of developers on development timelines and schedules. 3) Building a really good, inspiring community and culture with the team. Ideal work environment: In a coffee shop on the weekend with a hot chocolate and headphones on. Superpower: Team building and building a group around her that wants to be involved in what they’re developing. Favorite productivity tool: Hubspot CRM. Unproductive habits to improve on: Hearing about other people’s stories and getting wrapped up in comparison. 90-day goal: Scaling the business through expanding into more YMCAs and building out more requested feature functions. 1) Talk to your potential customers. Go out and talk to real people who are going to use your product. 2) Don’t be afraid to reach out to new people and ask for advice; you never know who will become a champion of you or your product. 3) Listen to ideas and learn from people you’re talking to that may be opening up new avenues for you.